U.S./NATO bombers massacre children in eastern Afghanistan – once again! The terror campaign by U.S. imperialism against the people of Afghanistan has led to another massacre of children. If Iran or Syria or Russia massacred children, it would be top news in the U.S. mass media. U.S./NATO massacres of innocent children, however, merit a few short paragraphs buried at the very bottom of the Digest briefs column of page 8 on the Feb. 14 Washington Post. What happened? 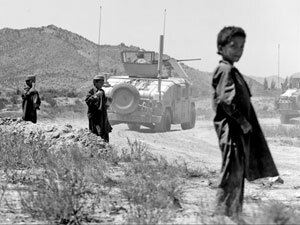 A six-year-old boy and seven other children under the age of 15 were mutilated by NATO bombers near the village of Giawa in eastern Afghanistan. The children were bombed not once but twice while they were herding sheep. The boys had lit a fire to keep warm during a heavy snow when NATO aircraft blew them to pieces, according to officials of the Afghan government. A NATO general used the usual throwaway line when asked about this most recent massacre of Afghan civilians: “any death of innocents not associated with armed conflict is a tragedy,” stated NATO official Brig. Gen. Carsten Jacobson. Mutilating and murdering a group children “not associated with armed conflict” is not a tragedy. It is murder and a war crime. This is a U.S. war of occupation. NATO is a cover, a fig leaf for one of many current Pentagon military operations. It is not a war to defend the people of the United States. Like Iraq, and Vietnam before it, this is an imperial war for empire. The people of the United States demand that the decade-long war that has taken the lives of tens of thousands of Afghans be ended immediately and that the perpetrators of war crimes be arrested and tried for their crimes. The ANSWER Coalition has initiated a demonstration on March 27, 2012 in Baltimore, Md., to protest the speaking engagement of Gen. Stanley McChrystal, the former commander of the U.S./NATO in Afghanistan. McChrystal is notorious for the use of assassinations and other death squad tactics conducted under his leadership by Joint Special Operations Command (JSOC). Click here for details about the March 27 demonstration which will demand the immediate withdrawal of all US and foreign forces from Afghanistan.